*****This is an Executive Demo, please call for availability***** We are excited to offer this 2018 MINI Hardtop 4 Door. This MINI includes: SIRIUSXM SATELLITE RADIO HD Radio Satellite Radio TRANSMISSION: 6-SPEED AUTOMATIC W/STEPTRONIC Transmission w/Dual Shift Mode A/T 6-Speed A/T WHITE TURN-SIGNAL LIGHTS PREMIUM PACKAGE Keyless Start Generic Sun/Moonroof Power Door Locks Keyless Entry Sun/Moonroof Premium Sound System Dual Moonroof BLACK BONNET STRIPES *Note - For third party subscriptions or services, please contact the dealer for more information. * Save money at the pump with this fuel-sipping MINI Hardtop 4 Door. The MINI Hardtop 4 Door Cooper will provide you with everything you have always wanted in a car -- Quality, Reliability, and Character. This is the one. Just what you've been looking for. We look forward to seeing you soon! Please call us for more information. We are excited to offer this 2019 MINI Clubman. This is an Executive Demo , please call for availability. Stylish and fuel efficient. It's the perfect vehicle for keeping your fuel costs down and your driving enjoying up. The look is unmistakably MINI, the smooth contours and cutting-edge technology of this MINI Clubman Cooper will definitely turn heads. You can finally stop searching... You've found the one you've been looking for. Just what you've been looking for. With quality in mind, this vehicle is the perfect addition to take home. We look forward to seeing you soon! Please call us for more information. We are excited to offer this 2019 MINI Hardtop 4 Door. This MINI includes: SIGNATURE LINE PACKAGE BLACK BONNET STRIPES SIRIUSXM SATELLITE RADIO *Note - For third party subscriptions or services, please contact the dealer for more information. * Everyone hates the gas pump. Skip a few gas stations with this super fuel efficient MINIHardtop 4 Door. This is about the time when you're saying it is too good to be true, and let us be the one's to tell you, it is absolutely true. Look no further, you have found exactly what you've been looking for. We look forward to seeing you soon! Please call us for more information. We are excited to offer this 2019 MINI Hardtop 4 Door. This MINI includes: SIGNATURE LINE PACKAGE BLACK BONNET STRIPES SIRIUSXM SATELLITE RADIO STORAGE PACKAGE ROOF RAILS *Note - For third party subscriptions or services, please contact the dealer for more information. * Stylish and fuel efficient. It's the perfect vehicle for keeping your fuel costs down and your driving enjoying up. The MINI Hardtop 4 Door Cooper will provide you with everything you have always wanted in a car -- Quality, Reliability, and Character. You could keep looking, but why? You've found the perfect vehicle right here. We look forward to seeing you soon! Please call us for more information. 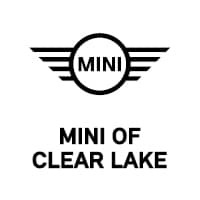 MINI of Clear Lake invites you to search our outstanding inventory of new MINI Small Sports Cars & Crossovers for sale near me in Houston, TX. Our team of MINI specialists are ready and waiting to help you find one of the best deals on new Small Sports Cars & Crossovers around. Don’t forget to ask about our great MINI Financing options, lease deals, and exclusive dealer incentives. Search our stock online, drop in for a test drive at 300 Gulf Fwy S, League City, TX 77573, or call (855) 997-4742 today to learn more.